It's not often we revert to the American spelling but in this particular instance the actual theme is spelt the simple way so we're going fall into line, despite our feeble objections. 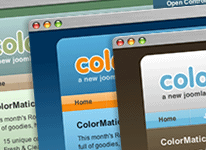 ColorMatic, is the latest offering from RocketTheme and they're not doing anything to let us down this month. The theme comes with 15 colour variations, three brand new modules for you to upload and a total of 16 fully collapsible module positions. There is more but you've got to click here for that info. Now, we are saying this a lot at the moment about the main theme providers but it really is the case that every month you should join just for the theme they are releasing. This one is also very special. If you haven't already, join the Joomla Themes newsletter to the left and we'll be letting you know very soon about some special offers from the leading theme providers. Otherwise click here to visit RocketTheme and sign up for ColorMatic.